The construction and design of REID steel through truss archspan bridges mean that the effective span of the bridge is between 15m to 240m. Our designs include 2-lane Carriageways. They are 7.3m wide between crash barriers. Each bridge will have local Reinforced Concrete decks 0.25m thick, which are placed on our lost formwork decking with no propping needed. They can have 0.05m of surfacing. They have three levels of steel crash barrier on both sides of the carriageways so that neither trucks nor their payloads can hit or damage the steel trusses. The Bridge Decks are carried by 2 trusses at, and above, deck level. These two trusses are stabilised with a bracing system. For bridges above 40m span, this bracing is usually above the carriageway, between the trusses (a closed top through truss). Below 40m span, this bracing is usually from Raker members down to the transoms (open top through truss). The bridge decks are cambered from side to side using pre-cambered steel transoms; and slightly cambered from end to end using the built in camber of the trusses. There are two walkways, both outside the main trusses, 1.2m wide, with handrails outside. The pedestrian, handcart and cycle traffic using them is protected from the vehicle traffic by the crash rails and main trusses. The decks of the walkways are local reinforced concrete 0.125m thick placed on our lost formwork decking. We design our bridges to British Standard BS 5400 for 2 lanes of full highway loading, and for 30 units of HB loading, equivalent to an occasional 120 tonne truck. All the structural designs are done in house by Reidsteel. All the steel work is hot dip galvanised 85microns, 610gm/m2, for long low maintenance life. Construction of the bridge can take place in-situ on a temporary causeway or on temporary jackable props; or may be built on the 'home bank' and Cantilever Launched across the gap. For the cantilever launch, a 'Launch Kit' is needed, consisting of sets of rollers, a steel 'launching nose' fitted to the leading edge of the bridge (and removed fro re-use after launch), and come-along cable jacks. If you choose to use Reid Steel for the design and construction of your bridge our work carries a ten year warranty. A steel through truss bridge is probably the most economic bridge for spans 15m to 240m. The carriageway is only about 1.2m above the abutment. A cantilever launch is relatively simple as long as there is a run up equal to 110% of the span is available on the 'home' bank. 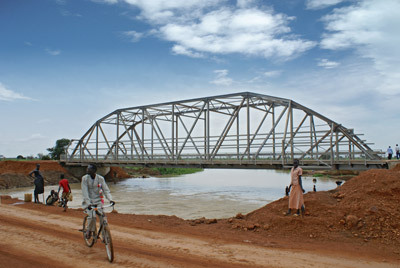 Or the bridge can easily be built on a causeway in-situ during a dry season. The bridge is good for multiple spans. But a through truss archspan bridge cannot be extended widthways, except by building another parallel bridge. To find out more about your Through Truss Archspan Bridge specific requirements, please complete our Highway Bridge Enquiry Form.